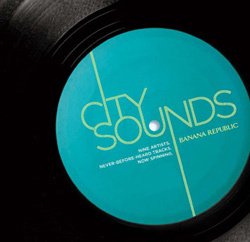 See also "Banana Republic City Sounds Volume 1"
This summer Banana Republic celebrates the inspiration of urban life with the release of City Sounds, a new digital album featuring never-before-heard tracks from the nine music artists appearing in the City Stories national ad campaign, including exclusive first tracks from OK Go and Liz Phair’s highly-anticipated new albums, as well as songs by Sara Bareilles, Ayo,Dashboard Confessional’s Chris Carrabba, Tommy Torres and more. The limited edition digital album, available as a gift-with-purchase only in Banana Republic stores starting May 13, reflects the diversity of these artists, ranging from acoustic soul to introspective pop, modern jazz to indie rock. Paris-based R&B songstress Ayo sings of her travels through European metropolises, while Sara Bareilles and Dashboard Confessional search for love amid the bars and streets of their adopted cities. Both acclaimed violinist David Garrett and Grammy-winning saxophonist David Sánchez find solace at dawn in the canyons of Manhattan, and Latin pop star Tommy Torres and emerging jazz bassist/vocalist Esperanza Spalding celebrate their beloved hometowns (San Juan and Portland, respectively) across the continent from each other. Among the tantalizing selections are brand new songs from Liz Phair andOK Go’s highly anticipated new albums due later in 2009, only available to customers who make a purchase in Banana Republic stores during the campaign. This musical dedication to jazz bassist and vocalist’s native city of Portland was written and recorded exclusively for the ’City Stories’ campaign. Grammy-winning saxophonist evokes the grooving modern jazz of ’60s Wayne Shorter and Miles Davis in this exclusive ’City Stories’ original composition.